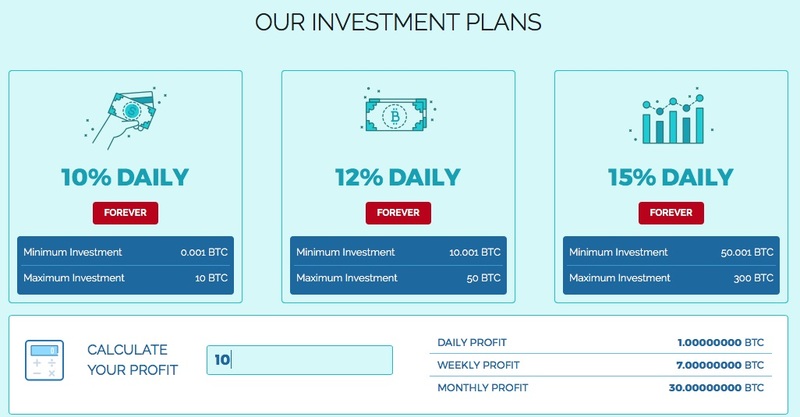 BitChair Review – Deceptive Bitcoin Mining Ponzi Scheme! BitChair is one of the most deceptive cryptocurrency mining destinations we’ve come across. Several components found on the site can effortlessly be debunked with a meager application of research. As you will learn through our unbiased review, BitChair is not a promising cryptocurrency mining site and should be avoided by any means necessary. Promising the rich rewards of ridiculously high returns while trying to portray their fictitious mining site as a legitimate operation are among a few of the elements we will dissect for you in this review. BitChair.biz is an online cryptocurrency mining site. Allegedly, investors who are interested in mining digital currencies are effectively enabled to do so in an automatic manner, where the mining is done for you. All BitChair asks from you in return is that you deposit bitcoins into their site which, depending on your initial deposit amount, will dictate which investment plan you become automatically enrolled in. As with most mining sites that turn out to be scams, BitChair employs a similar “deposit and forget about it” atmosphere that functions only temporarily off of an unsustainable business model. The site bitchair.biz is owned and operated by a private limited company known as BitChair Limited. Registered under the company number 10939314 this company was incorporated on August 31st, 2017. A CompaniesHouse report will reveal that BitChair Limited is currently an active company and can be found at their registered office address of 28 Millharbour, London, United Kingdom, E14 9TX. The director of BitChair Limited is Fred Phillips, who was born in April 1980 and currently reflects a British nationality. His correspondence address is the same provided for the BitChair Limited corporate address. The telephone number provided for BitChair is +44 618 345 9757 while their listed contact email address is [email protected] Other forms of communication found on the site would be their their contact form which can be found on their Support page. Bear in mind that most legitimate cloud mining sites only amass an annual return just under 30%. As you can see with BitChair’s investment plans, they are claiming they can outshine all other competitive cryptocurrency mining sites within a 3 day period. It is evident that BitChair is a too-good-to-be-true cryptocurrency offer and that the sole motive behind this site is to loot as many bitcoins as possible before they are forced to shut down. Remember – Once you send cryptocurrency coins, they are irretrievable due to their decentralized nature! So only send them if you are beyond confident that the offer is not a scam or hoax! As with most Ponzi schemes that spring into operation, BitChair has fulfilled withdrawal requests by investors and affiliates for the first few weeks of operation. These withdrawal requests are in part paid for by the deposits of new investors who register and get started with one of BitChairs investment plans. Recent community feedback will reveal though that BitChair has stopped fulfilling withdrawal requests and has resorted to the straight theft of Bitcoin deposits. Is BitChair a Ponzi Scheme? Through the evidence we have gathered, it is clear to us that BitChair is the perfect example of a Ponzi scheme. The main motive behind Ponzi schemes are to capitalize as many leads as possible so that the creators behind these sites can generate the most amount of profits in the shortest allotted time. BitChair operates in the same manner. They promise investors ridiculous returns. Then, within a few shorts weeks of operation, they shut down their operation and ignore all withdrawal requests. Ultimately, sites like BitChair only initially acknowledge withdrawal requests for a short duration of time and use part of the deposits executed by new investors to fulfill these withdrawal requests. Of course, the operators behind these sites keep a hefty chunk of the deposited bitcoins for themselves with each transaction conducted. BitChair is no different in this aspect, it is evident that when they first launched into operation that they were fulfilling withdrawal requests, but now they have resorted to ignoring all requests and have moved onto solely stealing all Bitcoin deposits. A SimilarWeb.com report will inform us that bitchair.biz has a global rank of 10,597, indicating it’s a highly popular site. Much of BitChair’s traffic consists of people from Brazil, United States, Russia, Ukraine and India. Now, while it may appear that BitChair is a semi-popular mining site amongst cryptocurrency investors, it should be noted that more than half of the traffic that visits the site comes from traffic exchange sites, where web surfers get paid to surf sites that have paid advertising fees to have their sites featured and surfed. This practice tricks sites like Google and SimilarWeb into believing that the site is receiving more traffic than they are organically receiving. Not only is this unethical, but merges all to well with the type of operation that BitChair is providing which is one that is deceptive and corrupt. BitChair is an untrustworthy cryptocurrency mining site that most accurately fits the description of a Ponzi scheme! If you deposit any bitcoins into BitChair, do not expect to get them back, according to recent feedback submitted by those who have suffered losses at the hands of BitChair. It has been obvious from the beginning the sort of ill-natured operation that BitChair is providing which is why we advice prospective cryptocurrency miners to avoid BitChair through whatever measures necessary. Review Verdict: BitChair is a Ponzi Scheme! Do you have any first-hand experience regarding BitChair? Please share any information with us by leaving a comment below. For legitimate mining opportunities, you’re welcome to visit our Cryptocurrency Mining Guide. Same experience here, my withdrawal pending now for 13 days and no answer from there support!! now they opened another site to verify. we should send the last withdraw for proof. these people are without any soul.